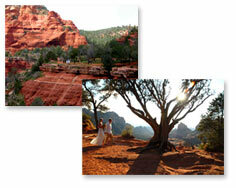 Outdoor Wedding Packages - Sedona Arizona, wedding planner, Weddings in Sedona. After working with couples for years, we have discovered that there are certain common denominators that most couples want at their weddings. To cater to these desires, and to make life simpler, we have developed packages which provide a romantic yet affordable wedding for smaller groups. 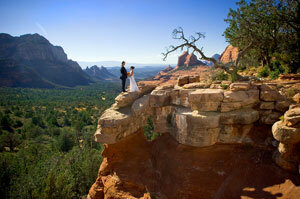 All with the level of quality and professionalism that Weddings In Sedona provides. All of our packages come with something standard - unlimited planning and consulting services by phone or email. 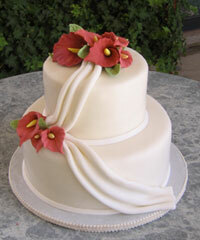 In addition, your officiant will work with you to customize your ceremony to your exact wishes. While these packages are for the ceremony only, we are well equipped to help you plan a reception, too. See also our list of chapel wedding packages. 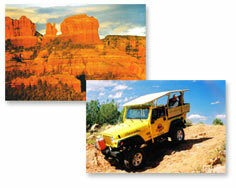 Take advantage of Sedona's more remote and intimate locations. Note: For weddings of 20 persons or more, we require that clients retain the services of a site assistant for 90 minutes. Such services are charged at $100.00 per hour. A full-color, decorative keepsake certificate suitable for framing. Note: The above wedding is designed for groups no larger than 14 persons, including the wedding party. For weddings of 15 persons or more, we require that clients retain the services of a site assistant for 90 minutes. Such services are charged at $100.00 per hour. The above weddings take place outdoors, at the location of your choice. 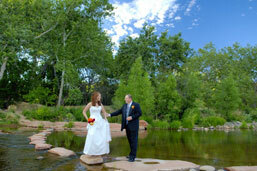 Many couples exchange their vows at the most photographed site in Sedona, at Red Rock Crossing by Oak Creek, with Cathedral Rock and the buttes of the "two lovers" in the background. Many couples want to enjoy the breathtaking experience of being married in a hot-air balloon as they drift through the spectacular red rock environment. The Red Rock Balloon package encompasses all the elements of a memorable wedding - including the fact that it's airborne! Note: All balloon ceremonies lift off in early morning. Depending on the time of year, this can be as early as one hour before sunrise. Add an Adventure Upgrade to your Outdoor Wedding Package! There are two options available to you, at two beautiful and more remote locations. This affords you the opportunity for more privacy at your wedding ceremony, while taking advantage of magnificent red rock views. The second Adventure Upgrade will take your entire group by jeep to "Bradshaw Hill". A Day in the West Jeep Tours will transport you on a gorgeous sunset journey to a wedding site with beautiful red rock backdrops, not far from Native American ruins. This upgrade can accommodate up to 49 guests (7 jeeps). Ask your planner at Weddings in Sedona about this amazing opportunity to create a wedding memory you and your guests will never forget!